I would like to start off by saying that it gives me no pleasure to talk about bad food at restaurants. I do feel, however, that it’s important so speak truthfully about the experiences I had in Egypt, both good and bad. Unfortunately, the restaurant food I had in Luxor was, for the most part, pretty lousy. First off was a restaurant with the impossible-to-pronounce name El Kababgy. It’s right on the Nile, and in fact the best part of the meal was the view. I sat drinking a beer, watching the sun set over that ancient river and the feluccas (sailboats) come in to dock (check out the view here). Kababgy was justly lauded by my Lonely Planet Guide for their English (and Spanish, and French)-speaking staff, but I don’t think the food was very good. The vegetables stuffed with rice cost 40 LE, about eight dollars, managed to be the most expensive meal I had on my entire trip as well as the worst. It was almost completely tasteless, and I reached for the bottle of hot sauce on the table to perk it up a bit. Then I noticed sauce was a bottle of Heinz brand sauce. Sigh… Kababgy is pretty much the definition of tourist trap, though you can’t beat the view. Lonely Planet also recommended my other restaurant excursion in Luxor, which was Sofra. 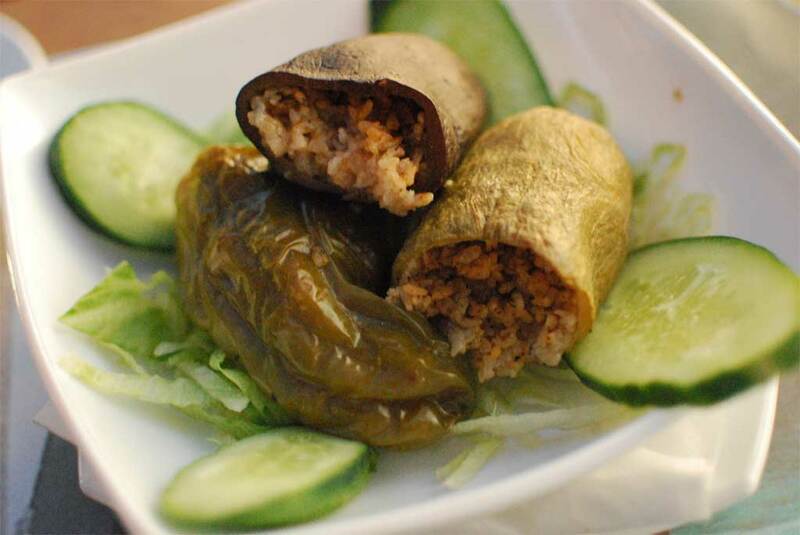 The picture at the top of this post was my appetizer, khiyar bil zabadi. It’s a pretty standard mix of yogurt, cucumber, garlic and mint. 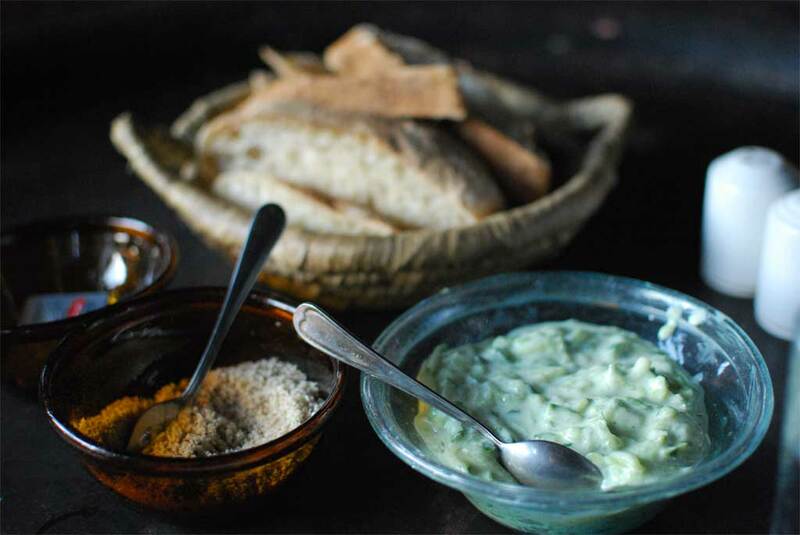 At Sofra they serve it with a big basket of bread, as well as sesame salt. The sesame salt was the most intriguing part of the meal, and it really improved the flavor of the dish. 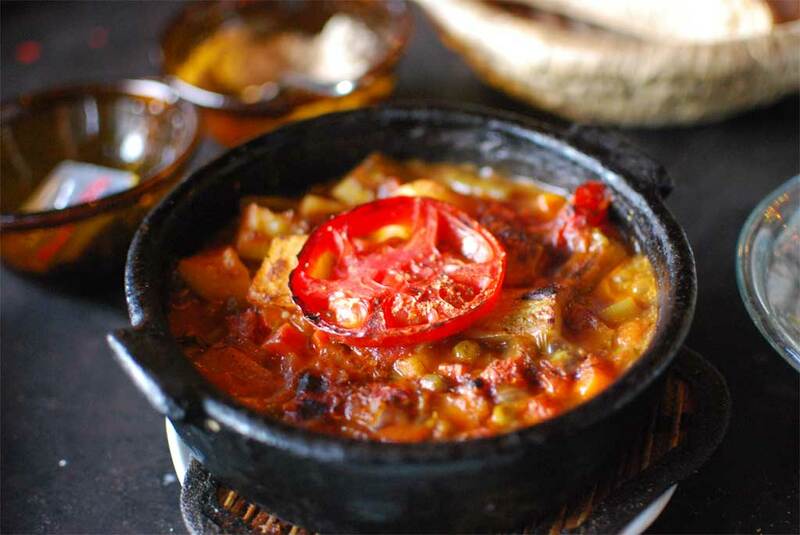 One of the most ubiquitous dishes in Egypt is tagen, a stew cooked in a clay pot similar to the Moroccan tagine. At Sofra they offered a vegetarian version, which was filled with frozen vegetables and a flavorless tomato sauce. It was hot and bubbly, but required a lot of salt to make it palatable. I didn’t finish either one of the dishes I ordered at Sofra. Still, the total cost of the meal was 28 LE, less than $6, so it wasn’t a huge waste. I’m sure there are good restaurants in Luxor, I just didn’t eat at any of them. Just as in Cairo, I had much better food from vendors on the street. I also learned that although I love Lonely Planet for their maps and straightforward travel advice, I won’t be taking their restaurant advice again any time soon.